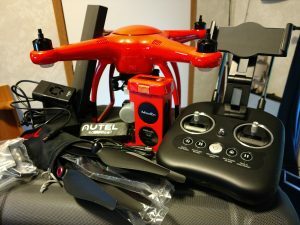 The Autel X-Star Premium is a great drone at a great price point. The camera quality is spectacular, and flying the drone is as easy as it gets. Please watch my video review below (where you’ll also see some footage from the X-Star), or you can also keep scrolling to get my thoughts in basically the same format, only in print. Straight out of the box, you’ll see pretty much everything right there. But let’s talk about the box itself first. It’s not a cheap cardboard box with foam inserts. This thing is actually like a sturdy suitcase with stiff foam that is fitted to each part you’ll receive with the drone. It’s a semi-hard case with a heavy-duty zipper that looks and feels like it will last a lifetime. The drone comes in either orange or white, depending on your choice. The orange is generally about $50 higher. The great thing about the orange color (affectionately referred to as the flying pumpkin) is that it’s so easy to see in the sky, whether against the clear blue sky, or a group of clouds. It has a very sturdy, durable shell and simply ‘feels’ premium. The weight is nice, weighing in at about 3.13 pounds, so it certainly doesn’t feel like a cheap, lightweight drone. It has the standard-looking landing gears with black markers to help determine the orientation in the air. There are also bright multi-colored LEDs under each prop motor to help determine orientation, but also provide various status indicators. The X-Star is equipped with GPS and GLONASS for steady navigation. It also has Autel’s StarPoint(R) positioning system, which is basically a bottom-facing camera as well as SONAR to help steady itself at lower altitudes. The aircraft battery is a 4900mAh battery which provides up to 25 minutes of flight time, which is pretty standard for a drone of this size. The gimbal mount is a pretty standard 3-axis gimbal that provides steady, buttery smooth footage. But that’s where it stops. The great part about the gimbal mount is that it detaches from the drone. It’s built to be modular, allowing replacement of just the camera if something happens to it, or allowing for future upgrades. The camera is a 4k camera, which provides 4k resolution at 30fps. You also get 2.7k @ 60fps, 1080p @ 120fps and 720p @ 240fps. Still images weigh in at 12 mpx and offer single shot mode, as well as burst, auto exposure bracketing (for HDR photos) and time lapse photos. Check out the video above for samples of both video footage and photos. The controller is as nice as they come. It comes with a 6000mAh battery which lasts quite some time (I’ve yet to run it out of juice!). On the X-Star Premium, you get up to 1.2 miles of range (2000 meters). There are buttons to start the motors, auto take-off and land, go home and pause, making flight tasks as simple as the press of a button. There are also wheels at the top left and right of the controller to control gimbal angle and exposure value. A button underneath each of those wheels allows you to start/stop video recording, and take a photo. There are 3 modes you can put the controller in to set how the sticks operate. By default the left stick will control up/down and rotate left/right. The right stick will control forward/backward, and left/right movement. One of the really cool things about the controller is its LCD screen. 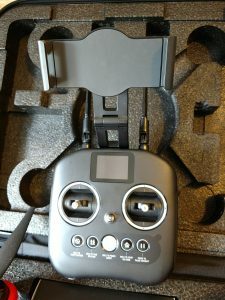 It provides battery level indicators for the drone and the controller itself, as well as the gimbal angle, distance of the drone to its home point, speed of the drone as well as other telemetry data. I find myself looking at the controller’s LCD screen nearly as much as I do my phone when viewing the live video feed. The X-Star Premium is simply a pleasure to fly. Again, the controller makes it simple to take off and get started. On initial take-off, the drone will ascend to about 10-12 feet in the air and hover, waiting for your command input. Controlling the drone is simple, but with a top speed of around 35 mph, you’ll want to be extremely careful until you get comfortable with the controls. Altitude is your friend when learning to fly – there are far fewer obstacles at 100 feet than there are at, say, 20 feet. The drone is responsive and stable. When you release the controls while flying in GPS mode (the default), it will hover in place. It does a pretty good job at it too – even in the wind. Movements are also smooth and stable, making flight predictable…which is a good thing! My only complaint is with the yaw – it isn’t quite as smooth as I’d like it to be. I hear there is a firmware update just around the corner, and I’m hoping this is fixed in that update. I’m simply blown away by the camera on this drone. This is the first 4k camera of any kind that I’ve ever owned. I’ve seen footage from them, but still I’m blown away. I encourage you to take a look at the video above to see some samples. You can also see some other samples of footage on my YouTube channel. 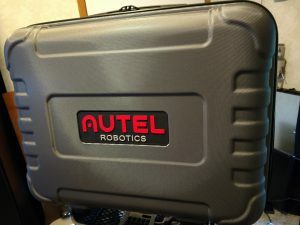 Thanks for reading my review of the Autel X-Star Premium. 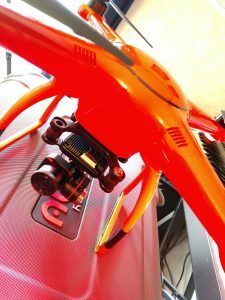 In the end, what made my purchase decision easy was that the research I did bore out that the X-Star was built solid and sturdy, and that the camera quality was outstanding. Something I didn’t mention though was that everything I hear about Autel’s customer service is nothing but praise. This is a US-based company, so getting in touch with them near my timezone is a huge plus. Knowing they’re a class-A team is huge as well.